What a hideous monstrosity. This has to be among the world's ugliest diesels. As well as being ugly, it's a flawed design. On most units with low short hoods, the windows above the hood allow excellent visibility of the track ahead. On this one, the driver would have to be around 9 feet tall to see out of them! 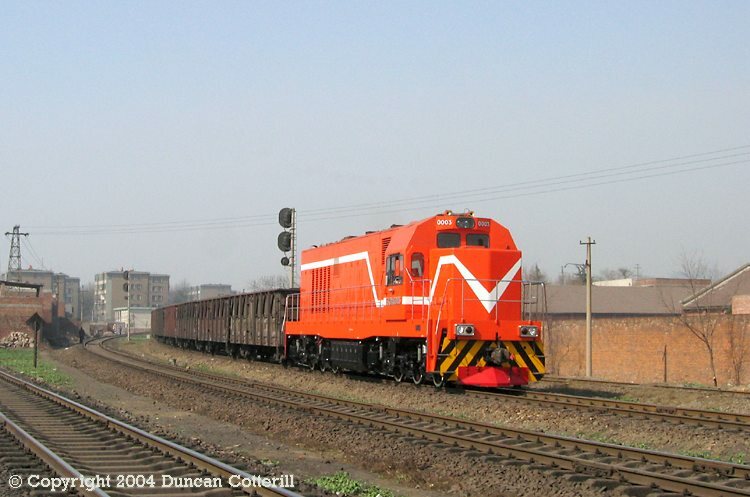 The unit, GKD3B 0003 was built by Ziyang works and had been at Pingdingshan on trial for about a month when it was photographed approaching Shenxi yard with a loaded train from Yikuang (Mine 1) on 17 February 2004.